There’s something special cooking in the kitchens of Dolma Ling Nunnery and Institute in northern India. For the past several years, the nuns at Dolma Ling have made tofu once a week to supply the nunnery kitchen for meals. There are a lot of mouths to feed at the nunnery, so being able to make tofu in-house is very important. Currently there are over 230 Tibetan Buddhist nuns who live at Dolma Ling Nunnery and there are also teachers and visitors. The nuns follow a vegetarian diet and tofu is a nutritious and protein-rich part of their weekly menu. Nuns in 2013 making tofu at Dolma Ling Nunnery. Photo courtesy of Brian Harris. The nuns also sell any extra tofu to visitors and the local community to help support the nunnery. This generates a bit of income for the nunnery but, so far the demand for tofu has outstripped supply because the nuns’ had a limited capacity to make tofu due to the size of their tofu kitchen and the capacity of their tofu-making machine. It has been the nuns’ wish for several years to purchase a larger tofu machine and to have a new tofu kitchen so that tofu could be made and sold on a larger scale. There is a great demand for tofu from nearby communities so the income from tofu sales will help to support the nunnery. The new facility for making tofu was built a while ago but the donor who had originally offered to provide a special tofu-making machine was unable to raise the necessary funds to purchase and ship the machine to India. So the project was delayed by almost two years. We are delighted to tell you that this spring, Norman Steinberg, a generous donor from Canada, has helped fulfill the nuns’ long-term wish by funding the purchase of a much larger and more efficient tofu-making machine and by helping to establish a special tofu kitchen at the nunnery. We are extremely grateful for his support. A big advantage of the recent donation is that it has allowed the Tibetan Nuns Project to purchase an Indian-made machine, so we’ve avoided the costly customs and shipping costs and it will also be easier to service and repair in the future. Once the new machine is up and running and the tofu kitchen is firmly established, we’ll post another blog with photos. Making tofu is somewhat similar to making cheese, but rather than curdling milk you are curdling soy milk. The first step in the process is to soak the dried soybeans and mix them with water to produce soy milk. Soybeans are being prepared in the old tofu kitchen at Dolma Ling Nunnery. This photo was taken in 2013 by Brian Harris. Next the nuns add enzymes or acid to curdle the soybean liquid. Then they press the liquid to remove the liquid whey. Once there are just curds remaining they can be pressed into forms and cut into blocks. The Tibetan Nuns Project is extremely grateful to Norman Steinberg and another private donor from Canada, as well as other individual donors from around the world who made the new tofu-making facility possible. If you would like to learn more about how the nuns are moving towards greater self-sufficiency, or to help fund these efforts, please contact us at info@tnp.org or donate at https://tnp.org/youcanhelp/donate/. This entry was posted in Buddhist Nunneries, Dolma Ling Nunnery, Events, News and Updates, Tibetan Nuns Project Products and tagged Brian Harris, kitchen, tofu on April 23, 2015 by Tibetan Nuns Project. This year the photographs were taken by four professional photographers — Olivier Adam from France, Brian Harris from Canada, Harald Weichhart from Austria, and Jeannie O’Connor from the US. 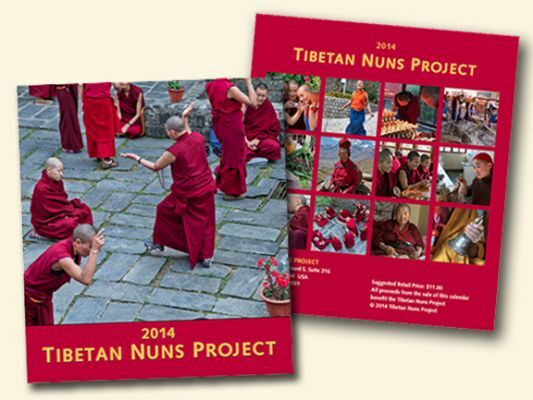 They are all friends of the Tibetan Nuns Project and donated their time and images to help the nuns. This entry was posted in News and Updates, Tibetan Nuns Project Products and tagged 2014 calendar, Brian Harris, Harald Weichhart, Jeannie O'Connor, Olivier Adam, Tibetan lunar calendar on September 19, 2013 by Tibetan Nuns Project. A special post by photographer and Tibetan Nuns Project supporter, Brian Harris. My wife Paula and I spent five weeks photographing at four Tibetan Nuns Project nunneries in India in April 2013. In the foothills of the Himalayas, Tibetan Buddhist nuns pursue their studies. Photo courtesy of Brian Harris. This entry was posted in Buddhist Nuns Life and tagged Brian Harris, Buddhist education, Buddhist nun, daily life, Dolma Ling Nunnery, Sponsorship of a nun on May 16, 2013 by Tibetan Nuns Project.